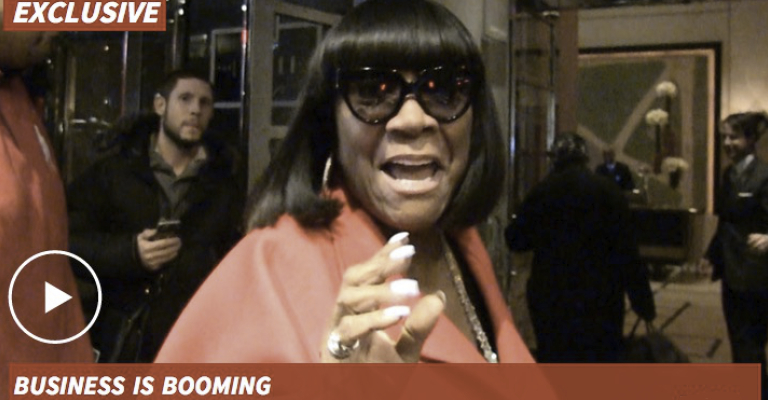 Patti LaBelle was stopped by a paparazzi guy the other night on an NY street and she quickly shut down his claims regarding the recent mega-surge in the sales of her sweet potato pies after her fan, James Wright’s, video went viral last week, causing Walmart to sell one of Patti LaBelle’s pies every second for 72 hours straight! I know one thing, it sure does sound like those sales were directly related to that video to me. Anyways, Patti made it clear that she is ultimately the reason for the pies’ sales success, not the guy in the Youtube video, although she also gave the man his props and was very appreciative for him posting his Patti pies praise video…she thinks he is a helluva singer. Check out how Patti put this paparazzi cat in check in a very classy and polite manner…and this is why we love us some Patti! Of course we can’t post about Patti’s now famous sweet potato pies, without posting the viral video that really is the reason behind the boosted sales that soared into over a million last week. Message to Ms. LaBelle: If you’re reading this, please don’t come for me for saying that, I mean it in the most respectful way and I know that your name is the real success behind your pies, but I still gotta keep it real and give credit where credit is due on this one…just saying. Terrence Howard Welcomes 2nd Baby With Wife He Married in Three Weeks!